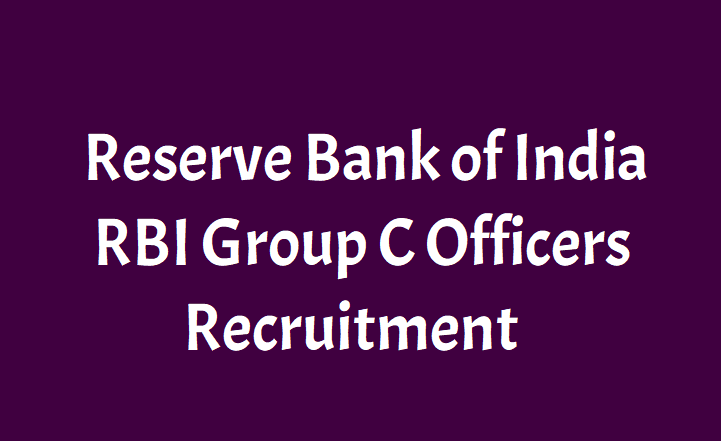 Reserve Bank of India has issued the Group C Officers Recruitment notification and last date to apply is 08.01.2019 and RBI invites applications for lateral recruitment of Officers in Grade ‘C’ on contract basis 2018. Reserve Bank of India (RBI) grade C officer recruitment has begun. “The Reserve Bank of India Services Board, hereinafter referred to as ‘Board’, would admit to the Examinations all the candidates applying for this post with the requisite fee/intimation charges (wherever applicable) on the basis of the information furnished in the ONLINE application and shall determine their eligibility only at the final stage i.e. interview stage”, reads the official notification. A total of 61 vacancies have been notified by the Bank. Interested candidates should apply for the post only after confirming their eligibility. Reserve Bank of India (RBI) has announced to recruit experts to Officer Grade 'C' posts through lateral entry scheme. To recruit specialists from outside underpins RBI's lateral entry process. The recruitment is also open to the employees of RBI (staff candidates). The central bank proposes to fill up 61 vacancies in prime banking areas such as trade finance, accounting, retail lending, treasury, etc. Engineering graduates who have substantial experience in IT discipline, predominantly, can apply as well. Those with minimum 5 years of work experience in commercial banks, large financial companies, financial services organisations, large IT services companies, Telecom companies working as an Officer at supervisory/ management/ executive level can register for RBI's lateral entry process. The last date for online registration is January 8. Out of the total number of vacancies 50 are reserved for candidates belonging to general category and 10 for those belonging to OBC category. RBI has capped the age limit, of the entrants, to 35 years. 'Appointment will be on full-time contract basis initially for a period of three years, extendable further, subject to a maximum tenure of five years,' said the Reserve Bank of India Services Board. 'The appointees would be required to upgrade their knowledge and skills periodically. The performance of the contract appointees would be reviewed annually to decide on the continuance of the contract,' it added further. Qualification: BE/ B.Tech/ M.Tech, PG Degree, PGDBA/ PGPM/ PGDM, CFA (USA)/ CA/ ICWA/ LLB/ LLM/ IFRS with relevant experience. Age(as on 01.12.2018): 25 to 35 years. Selection mode: Based on preliminary screening, interview. RBI Officers Posts Selection Process: The selection process will be through preliminary screening/ shortlisting followed by the interview. RBI Services Board reserves the right to limit the no. of candidates called for Interview by enhancing the minimum educational qualifications required as indicated above or through any other appropriate method. Candidates shortlisted for Interview will be issued Interview Call letter through email and their candidature will be subject to submission and verification of documents submitted in support of their claim with regard to eligibility for age, category, qualification, experience, etc. Application Fee: Candidates who will apply for the position need to pay Rs 100/- if belonging to SC/ST/PwBD, Rs 600/- is belonging from the general/obc category. For more details, candidates can take a look at the official site as well. . Candidates are required to apply only ONLINE through the Bank's website www.rbi.org.in. No other mode for submission of application is available. Brief Instructions for filling up the "Online Application Form" are given in Appendix-I. candidates should ensure that they fulfill the eligibility criteria for the advertised posts. The Reserve Bank of India Services Board, hereinafter referred to as 'Board’ would admit applications from all the candidates applying for this post with the requisite fee/intimation charges (wherever applicable) on the basis of the information furnished in the ONLINE application and shall determine their eligibility only at the interview stage. If at that stage, it is found that any information furnished in the ONLINE application is false/ incorrect or if according to the Board, the candidate does not satisfy the eligibility criteria for the post, his/ her candidature will be cancelled and he/she will not be allowed to appear for interview and can be removed from service without notice, if has already joined the Bank. Last date to apply online: 08.01.2019. Qualification: Minimum of 60% marks in Bachelor’s degree as well as in 12th and 10th Standard examinations. Qualification: Master's Degree in Economics/ Econometrics/ Quantitative Economics/ Mathematical Economics/ Integrated Economics Course/ Finance, with a minimum of 55% marks or an equivalent grade in aggregate of all semesters/ years. Qualification: Master's Degree in Statistics/ Mathematical Statistics/ Mathematical Economics/ Econometrics/ Statistics & Informatics from IIT-Kharagpur/ Applied Statistics & Informatics from IIT-Bombay with a minimum of 55% marks or equivalent grade. Or Master's Degree in Mathematics with a minimum of 55% marks in aggregate of all semesters/ years and one year post graduate diploma in Statistics or related subjects. Online examination (Paper 1) for General/ DEPR/ DSIM will be held on 17 June 2017.
Who are not eligible to apply? Those candidates (belonging to general category) who have already appeared for the phase 1 exam 6 times for this post are not eligible. RBI will provide pre exam training to the candidates belonging to SC/ ST/ OBC/ PWD candidates for Officers in Gr. B (DR)-General post only. Candidates will be given the training for phase 1 and 2 exam and it will be free of cost. Master's Degree in Statistics/ Mathematical Statistics/ Mathematical Economics/ Econometrics/ Statistics & Informatics from IIT-Kharagpur/ Applied Statistics & Informatics from IIT-Bombay with a minimum of 55% marks. Or Master's Degree in Mathematics with a minimum of 55% marks. For all other details such as reservation of vacancies, eligibility criteria, scheme of selection, submission of online applications and other instructions, refer to the detailed notification to be published shortly on the Bank’s website. Last date of receipt of applications: 23.05.2017.